It all began with a newspaper article in the online edition of my favourite newspaper, when I came across a report about the evils of eating margarine. Yes, you have read this correctly, because I seem to have read endless articles about the evils of butter and the benefits of margarine over the years. The article pointed out that margarine was originally developed as a product to quickly fatten turkeys in the USA. When the turkeys became ill and died, the manufacturers were left with so much margarine in their stores that they scratched their corporate heads in despair, asking themselves what they should do with their newly created margarine mountain. The answer was of course perfectly obvious, to feed it to humans instead. I nearly dropped my piece of toast, which was liberally spread with expensive cholesterol reducing margarine and lovingly coated with Marmite. I read disturbing accounts about the margarine industry’s efforts not only to turn the butter loving public away from this ‘natural’ food into eating a plastic substitute that was not fit for turkeys, believing that it was good for them. We have all been assured in the past that if we eat margarine instead of butter we would be less likely to have a heart attack or stroke, and recent promotions even claim to reduce cholesterol. What’s not to like? So, what has this to do with the butter dish and the Canary Islands, I hear you asking. 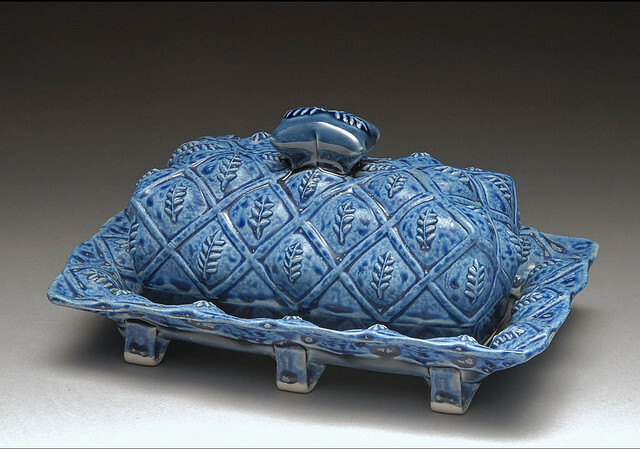 Well, for many years I have been searching for a butter dish made by a manufacturer that ceased production many years ago, in order to complete a set of much loved tableware. In view of this article and many others, we decided to switch back to butter, in moderation, of course. Imagine my delight when I found a brand new butter dish from this manufacturer on an auction website. It was exactly what I wanted, and so I purchased it right away. Clearly, the Canary Islands do not welcome butter dishes. Having been down this route many times before with other items, and having learned never to give up. I arranged for the butter dish to be sent to a friend in the UK. From there, I will either collect it during my next visit to the UK, or ask one of our friends to bring it with them when they next visit the Canary Islands. I can then once again enjoy seeing butter in an attractive butter dish, instead of a plastic box. Yes, I guess we all have our little obsessions in life. Meanwhile, if you would like more information about the evils of margarine, I suggest a little first hand research on Google along the lines of “butter versus margarine”. Recent research studies may surprise and shock you.